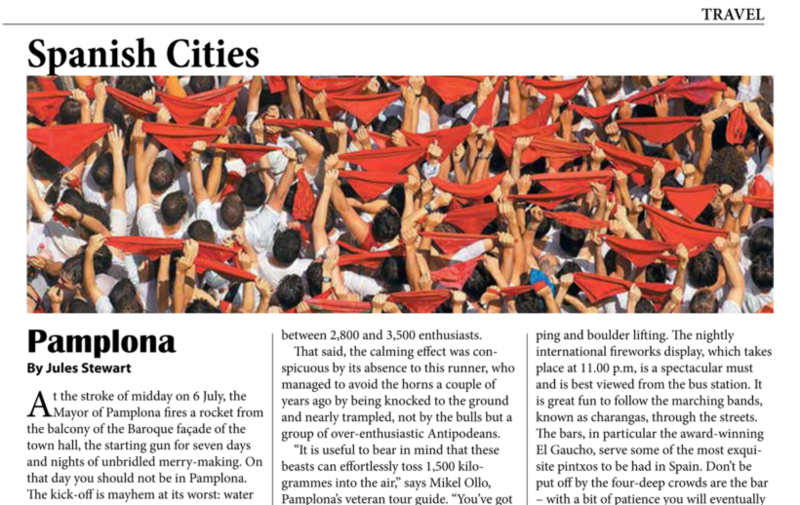 At the stroke of midday on 6 July, the Mayor of Pamplona fires a rocket from the balcony of the Baroque façade of the town hall, the starting gun for seven days and nights of unbridled merry-making. 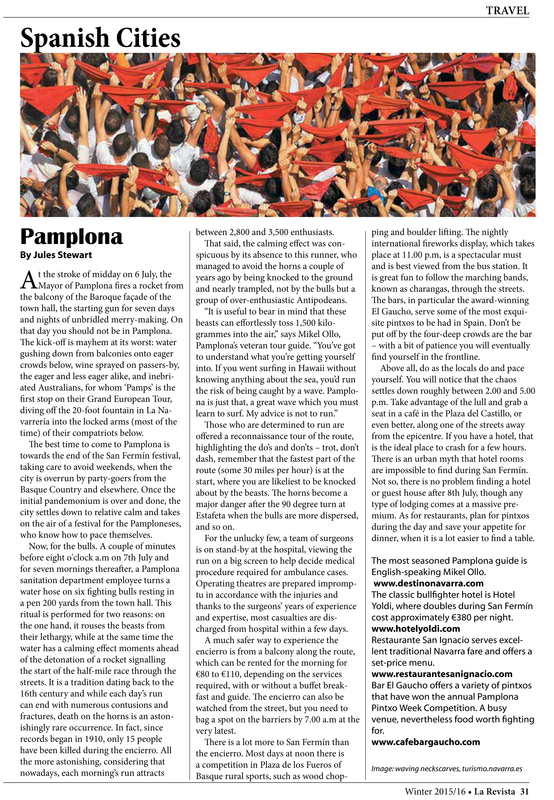 On that day you should not be in Pamplona. The kick-off is mayhem at its worst: water gushing down from balconies onto eager crowds below, wine sprayed on passers-by, the eager and less eager alike, and inebriated Australians, for whom ‘Pamps’ is the first stop on their Grand European Tour, diving off the 20-foot fountain in La Navarrería into the locked arms (most of the time) of their compatriots below. Those who are determined to run are offered a reconnaissance tour of the route, highlighting the do’s and don’ts – trot, don’t dash, remember that the fastest part of the route (some 30 miles per hour) is at the start, where you are likeliest to be knocked about by the beasts. The horns become a major danger after the 90 degree turn at Estafeta when the bulls are more dispersed, and so on. For the unlucky few, a team of surgeons is on stand-by at the hospital, viewing the run on a big screen to help decide medical procedure required for ambulance cases. Operating theatres are prepared impromptu in accordance with the injuries and thanks to the surgeons’ years of experience and expertise, most casualties are discharged from hospital within a few days. A much safer way to experience the encierro is from a balcony along the route, which can be rented for the morning for €80 to €110, depending on the services required, with or without a buffet breakfast and guide. The encierro can also be watched from the street, but you need to bag a spot on the barriers by 7.00 a.m at the very latest. There is a lot more to San Fermín than the encierro. Most days at noon there is a competition in Plaza de los Fueros of international fireworks display, which takes place at 11.00 p.m, is a spectacular must and is best viewed from the bus station. It is great fun to follow the marching bands, known as charangas, through the streets. The bars, in particular the award-winning El Gaucho, serve some of the most exquisite pintxos to be had in Spain. Don’t be put off by the four-deep crowds are the bar – with a bit of patience you will eventually find yourself in the frontline. Above all, do as the locals do and pace yourself. You will notice that the chaos settles down roughly between 2.00 and 5.00 p.m. Take advantage of the lull and grab a seat in a café in the Plaza del Castillo, or even better, along one of the streets away from the epicentre. If you have a hotel, that is the ideal place to crash for a few hours. There is an urban myth that hotel rooms are impossible to find during San Fermín. Not so, there is no problem finding a hotel or guest house after 8th July, though any type of lodging comes at a massive premium. As for restaurants, plan for pintxos during the day and save your appetite for dinner, when it is a lot easier to find a table. cost approximately €380 per night.